We are located 12.5 miles south of Loop 323 on Hwy 155. When you go south on Hwy. 155, you will pass over the first bridge of Lake Palestine. After you pass the first bridge, continue about 1/2 mile to yellow blinking caution light. Turn left (east) at the light (C.R. 1170), and go about ½ mile until the road ends into Lakeside Getaway driveway. Go north on Hwy. 155 about 8 miles. 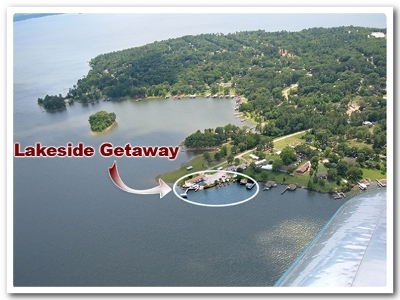 You will pass over two big bridges on Lake Palestine. Continue about 1/2 mile to yellow blinking caution light, turn right, go about ½ mile until the road ends into Lakeside Getaway driveway.